Oh how I've missed these shoes! I went and picked them up yesterday and in true me fashion, I couldn't wait to wear them. I am kind of sad because I found out via Yelp that the original shoe guy sold the shop and the new owners do shoddy work at best. So now I have to look for a new shoe repair shop. I am breaking the stupid no white after Labor Day rule. Who follows that anymore anyway? I see no point in packing up all the white stuff when it'll feel like summer until November. What fashion rules do you break on the regular? I have also broken my shopping freeze. After the yellow/orange stone debacle at the new house, I needed some retail therapy. Good news (I think) about the color of the stones is that the builder is going to acid wash the exterior of the house. Apparently, that's procedure for all houses once masonry is finished. 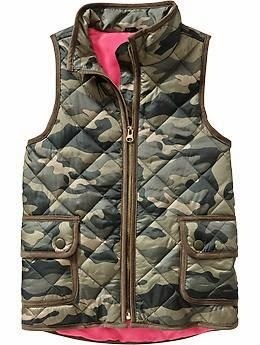 Anyhoo, JCrew Factory had a camo puffer vest but I just wasn't in love with the $98 price tag. But when Hannah from the blog Just Call Me Ha Ha posted this dupe from Old Navy I got just a little excited. Best part? With the 20% promo they are running, it only came out to $24 which is as much as I'd ever want to pay for such a trendy item. It is a kid's size so I ordered at XL which hopefully will fit a little better than the Quilted Zip Front Vest I got last year. Even the XS was a little big on me. But it does look like they offer it in Petite sizes this year. I wonder if the Petite size would fit a little more snug. My camo print collection is starting to get a little crazy and may soon rivaling my leopard print collection. I never thought I'd wear camo but here I am wearing it all.the.time. Since I hate paying for shipping I did a little more browsing to try and get my total to $50 for the free shipping. And then I found this plaid shirt. 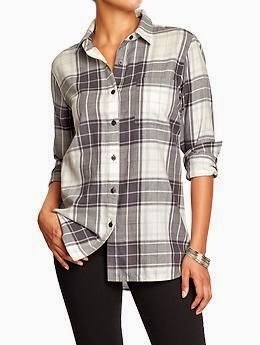 It reminded me of the one Veronika just bought from Banana Republic over the weekend. But since it's not available online anymore and I rarely have a chance to get to a mall these days, I figured this was a good alternative. Plus, it was only $16 with the 20% code. Figured it was worth a shot. Hopefully it won't make me look boxy like plaids tend to do. 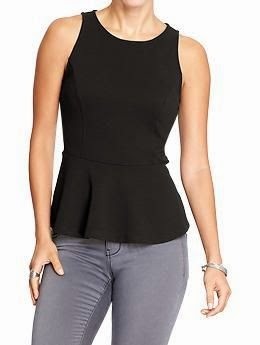 The last item I ordered was another peplum top. Because well...I love peplums. Plus I don't have a black one. Try T dons sattle and leather, Georgetown TX. I have some friends who've taken their boots to be fixed and their fixes are amazing. Thanks for the recommendation! And love that it'll be closer to me too. Sammie's was all the way on the lower deck next to Fiesta and I could never get there in time to drop off or pick up my shoes.